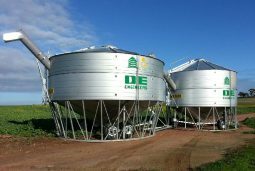 DE Engineers are the only manufacturer to offer ‘Twin tow’ Field bins. 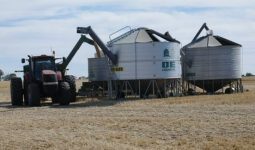 All of our field bins can be towed in tandem because of the steeper discharge auger allowing 2 field bins to be operated and transported with one tractor doubling stored capacity. 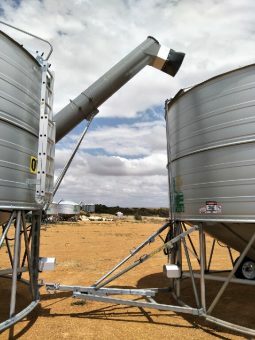 New style 63t and 76t field bins are being hooked together to hold in excess of 125t for around $69,000. This is half the cost of a ‘Mother bin’ with sealed segregated storage. 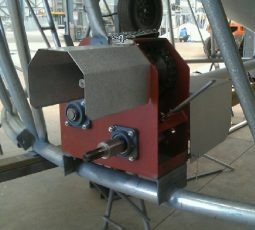 Twin Tow gearboxes and drive lines can be retro fitted to any DE Engineers field bins.